The yuan’s swings are becoming a headache for the Chinese companies that should have been the biggest beneficiaries of last year’s devaluation. In rare overt comments, exporters including Midea Group Co. and TCL Corp. are expressing apprehension about the nation’s exchange-rate policy. 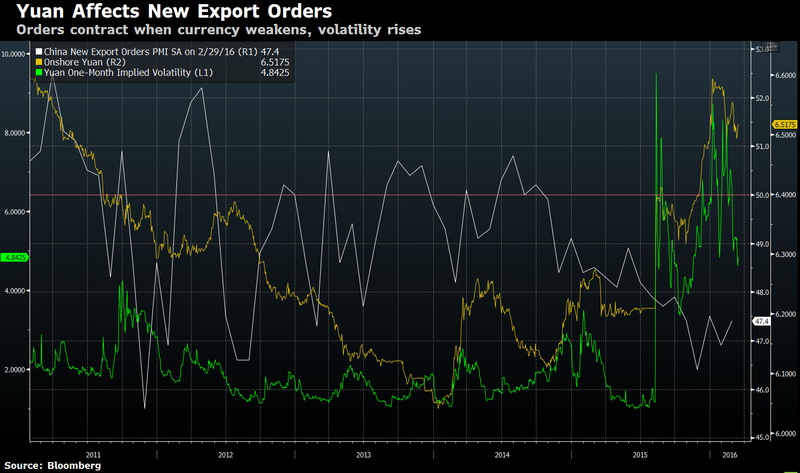 Two said the increased volatility has made it difficult to manage costs because customers are choosing to place only short-term orders, while a third said the yuan was allowed to strengthen far too much in the past few years. Exports slumped 25 percent in February from a year earlier and a gauge of overseas orders contracted for the 17th month in a row, while the currency’s volatility held near the highest levels since August’s shock devaluation. This illustrates the challenge facing Premier Li Keqiang as he balances the need to nudge the exchange rate lower to help an economy growing at the slowest pace in 25 years, while trying to avoid a run that would create financial instability. The currency, which has plunged 4.4 percent since last year’s devaluation, climbed in September and October, and dropped in the following three months before rebounding in February. It has strengthened 0.9 percent in March so far, almost wiping out this year’s losses. The wild swings contributed to an estimated $1 trillion in capital outflows last year. China’s capital outflows have eased significantly as domestic and overseas environment improved, the State Administration of Foreign Exchange said in an statement on Wednesday. Chinese banks sold a net 228.5 billion yuan ($35.2 billion) of foreign exchange for clients in February, the least since October, indicating lower demand for dollars. Reduced capital outflow pressures decrease the likelihood of a large one-time yuan devaluation, but gradual and managed depreciation is likely, Goldman Sachs Group Inc. economists led by MK Tang wrote in a note Wednesday. The yuan, which Royal Bank of Canada says is currently overvalued, will face renewed selling pressure once the Federal Reserve decides to raise borrowing costs again. The median forecast in a Bloomberg survey of economists is for a drop of 3.8 percent by the end of the year. Its decline against the dollar in 2015 -- the most in 21 years -- masked a sixth straight annual gain against the exchange rates of China’s main trading partners, according to a Bank for International Settlements index. This shows that there is more room for depreciation, according to Fuyao Glass Industry Group Co., which makes automobile windows and whose clients include BMW AG and Volkswagen AG. “The yuan is strong, so Chinese companies can’t go abroad and most exporters are making losses," Cho Tak Wong, chairman of Fuqing, Fujian-based Fuyao, said in an interview over the weekend. "China should allow the yuan to weaken. If the currency doesn’t depreciate, exports will be negatively influenced and export-focused firms will suffer." 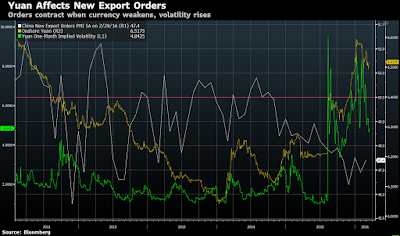 The volatility’s impact has spread far beyond the export sector, with companies across the board rushing to close dollar loans before repayments become more expensive. Local firms have redeemed $1.73 billion of overseas notes before maturity so far in 2016, up from $26 million a year earlier, according to data compiled by Bloomberg. Shanghai-based China Eastern Airlines Corp. said on Jan. 4 that it had repaid $1 billion in dollar-denominated debt to reduce its vulnerability to exchange-rate fluctuations. Huizhou-based electronics maker TCL said it liquidated all of its short-term dollar borrowings debts after the August devaluation, while Midea’s Yuan said her company has been reducing its foreign-currency debt for the past two years. TCL said it doesn’t look to profit from speculative trades using derivatives such as yuan forwards for fear of betting in the wrong direction. Clients are placing more short-term orders on concern that the yuan will weaken, said Li Dongsheng, TCL’s chairman and CEO. This compares with a one-year buffer when the currency is forecast to strengthen, he added.